For nearly 50years, Educational Insights has been providing solutions for teaching children the fundamentals of geography, math, reading, science and other subjects in a unique and interesting way with "hands-on" educational games, kits, manipulatives, books, toys, and electronic learning aids. Educational Insights was founded in 1962. and today is one of the largest manufacturers of hands-on learning materials in the world. In 2006, we became part of the Learning Resources (www.learningresources.com) family of companies. Our administration, product development, and marketing offices are located in Rancho Dominquez, California. Shipping, customer service, accounting, and purchasing departments are located at the Learning Resources headquarters facility in Vernon Hills, Illinois. Real educational value is built into each product from the very beginning. A team of experienced, professional educators serves as our editorial staff. These educators, along with talented marketers, artists, designers and engineers, work to develop, refine and transform learning concepts into top-selling, award-winning educational products. 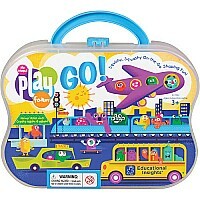 Today, Educational Insights produces over 800 items for both school and home markets designed to make learning fun. Since the late 1970's, our products have been in use in virtually every elementary school in the United States. The school market remains the backbone of Educational Insights' business. Solidified with over three decades of representation through an extensive dealer network, schools nationwide have grown to trust Educational Insights and recognize the proven effectiveness of our products. With our focus on fun as well as quality education, Educational Insights products have become extremely popular in the booming home "edutainment" market. Because we are dedicated to supporting quality, service-oriented dealers, we only sell Educational Insights brand products via retailers whose image, merchandising, and service are appropriate for our product line. We at Educational Insights are dedicated to producing and marketing the finest products in education. We're certain you'll find that our teacher-written materials match your children's needs and interests, while incorporating appropriate national teaching standards in a fun and motivating format. Educational Insights strives to remain a visionary in educational fun, and we invite you to share our vision!